A tablet or a smartphone ? A combination that offers the best of both devices. The Galaxy Note 2 is a unique species in itself. A big screen terminal for those who want to make the most of your photos, videos and applications , but without giving up the benefits of a mobile phone. An all in one of the most complete and pampered to detail. We tell you our impressions then after a dogfight with this terminal. The first thing we noticed, right out of the box, is its consistency. Your weight metal housing and help to give a very strong and a sense of robustness. All this without our sense fatigue in the hand, wrist or arm. We do not know what part of nature inspired design specifically for this terminal lines, but I can say that is a very stylish device and able to divert more of a look if you show in public. Of course, the highlight at the start of our first contact with the Galaxy Note 2 has been your screen. And not only for its 5, 5 inches in size, but by its sharpness. Super AMOLED technology shows vivid colors and brightness that helps keep her vision for the contents even when the sun is full on the screen. All in high definition, avoiding sawteeth in icons and widgets and can see its contours perfectly. Definitely one of the strengths of this terminal. And, lends itself to being the perfect canvas for the feature we found most important in this device, your stylus, aka S Pen. The Galaxy Note 2 terminal may seem similar to that seen in the market, excelling in its display and technical characteristics, but the S Pen is what really sets it apart. At the time in which we extract the lower right corner we have the feeling that the terminal becomes a complete tool. Take notes, edit images, create presentations, capturing moments ... are just some of the things that we offer to take control of the stylus. One thing that helps a new screen that appears on your desktop with only the S Pen remove your cubicle, avoiding to waste time looking for applying S Note down any detail. Following the S Pen must say that this is not a stylus to use. It has a very useful electromagnetic technology for the Galaxy Note 2 knows if you are on your site or what we have learned. But there is more. This technology can detect where we are pointing to a few millimeters of the screen, which is useful for retouching and professional editions and more people from Samsung been used for other issues like content preview. 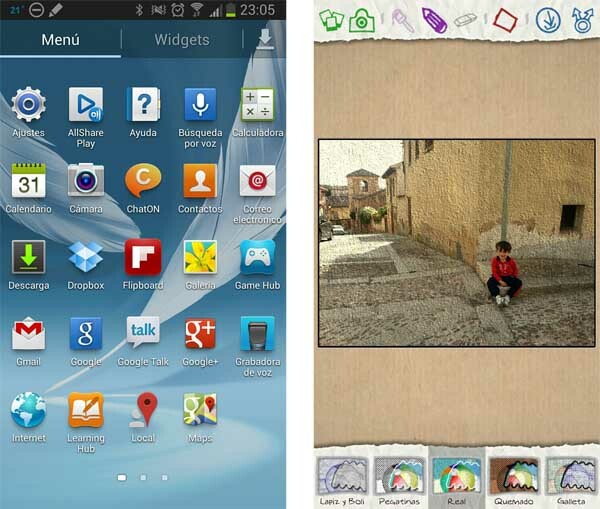 That is, when we access the gallery, if we bring the S Pen to a photo album, thumbnails are displayed containing images. We also found, in our experience with this terminal, the same thing happens with movies and buttons, the latter indicating that allow function. And there's more than talk stylus. The S Pen has a button on one side for different functions depending on the application and environment. Thus, we have proven that we can choose any image or a video frame, press the button and draw an outline you want. That portion is automatically cropped, allowing us to send it via email as an image, inserting or editing a note with any design application. Furthermore, by accident, discovered that a long press of the S Pen on a screen while we press the button lets you take a snapshot or screenshot, which, like the rest of the images can be retouched and edited with this pencil. Last but not least, we have seen the agile and response tuned S Pen, which allows us to write comfortably and swiftly with accuracy of our strokes. Something that helps semiretractil its tip, which absorbs pressure and helps writing or drawing. 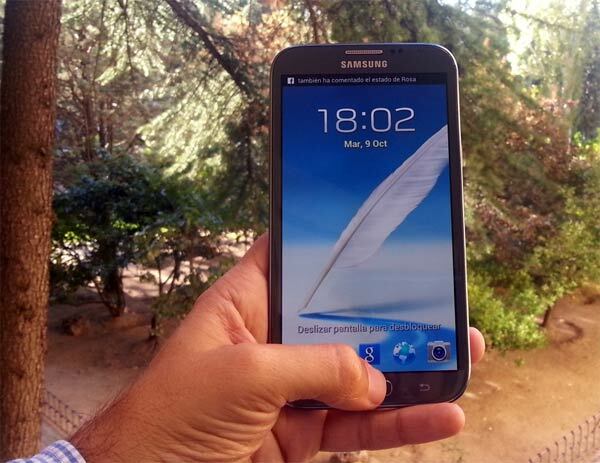 Apart from these physical characteristics, the Galaxy Note 2 is set to surprise. As we said at the beginning, has been taken care of every detail, making captivate with small actions like sounds to unlock the terminal, the activation of a new screen to extract the S Pen, or all options included as standard in its interface version 4.1 of Android , also known as Jelly Bean . Small issues that make use something nice, configurable options and the ever-present option to share. But let's see a little more detail. We have found the desktop option we liked. This is to establish homepage any different desktop screens. A pinch gesture shows all these screens and can point out the blue house icon in the upper right corner you want, accessing it each time you press the only physical button front terminal. All this without forgetting the deep customization options that can be animated to coincide or not with the lock screen. Something that appeals to the most concerned about the appearance of the terminal. And it is related to the screen have to talk about multitasking. Something in this terminal has taken a step further. We know the option to make a video thumbnail to play while we send an email or we move through the terminal. However, we have found that, thanks to the 5.5-inch screen and a powerful 1.6GHz processor, can run up to three applications simultaneously. You only had to deploy a small blue tab on the bottom left, which contains various functions or applications. Simply drag the desired screen, it is subdivided to show both, which may interact either with them, and allowing us to adjust the screen ratio desired for each. Another area that we liked in the Galaxy Note 2 is the cinematographer. Not so much for the sensor, which is equal to the Galaxy S3 with 8 megapixels, for your options. 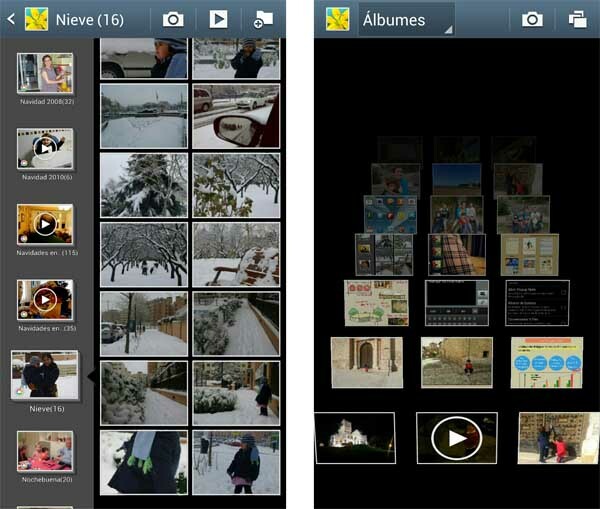 And we have found a complete solution when taking snapshots. 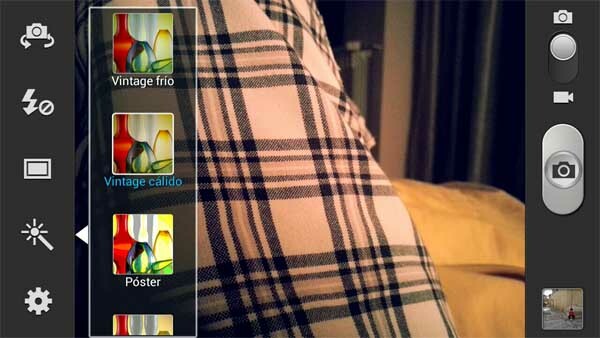 The style Instagram , thirteen filters have been introduced to implement directly in real time, before making the catch. Classic and Vintage filters, sepia, black and white, and others like Cartoon, Green, Blue ... all in the same screen frame. Alongside these filters have also seen its different shooting modes. Another utility that has caught our attention. Eleven possibilities depending on the reason and purpose of the image you want to capture. In addition to a normal photograph can choose the best photo mode to take eight sacks and choose the best, do the same but focusing on faces, capture a panoramic, photography automatically share with friends departing on her thanks to the face detection, automatic retouching catches or take pictures in low light conditions. All virtually automatic from the same screen capture, to save much time. All these images are stored in a redesigned gallery. 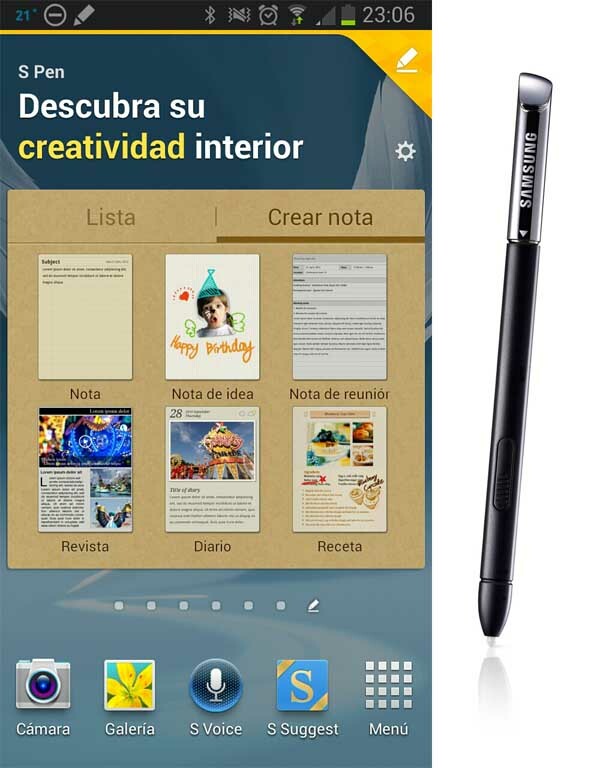 And is that the order in the Galaxy Note 2 no longer is an effort by the user. We have found that moving images from one folder to another is as simple as the world, allowing us to filter photos by location where they were taken, the date or the people who appear in them by simply selecting the desired option from the dropdown the top of the screen. Moreover, there are different ways of viewing the gallery, especially the spiral gustándonos, which takes us through the photos in a sort of carousel. And let's not forget the possibility of writing any dedication on the back of the pictures as we did years ago with the classic photographs. Finally, we emphasize our impressions of this terminal settings. And here are most of those details that make this handset unique and have been so careful. So we have found that, for those who suffer the Galaxy Note 2 has a screen too big, you can still use the keyboard to set one hand if this option from the Operations menu with one hand. Most concerned about reaching their data limit also have the chance to meet their current consumption and set limits. It offers a good amount of energy saving options to squeeze your battery and protect the terminal with several security options like searching the terminal in case of loss, alert the user if there is a change of SIM card, etc. To which we must add the other options and possibilities of the Android OS 4.1 and which are focused exclusively on the S Pen, where we found one that alerts us if we set off and not detected on your stylus introduced place to avoid losing it. In short, if a terminal and surprised by their technical characteristics, we have made ​​it clear that saves a lot more about the case. Details, sometimes they have achieved surprisingly tiny, giving us the feeling that it may be difficult to overcome, more intuitive and more interactive. All this accompanied by an almost magical tool, the S Pen, which transforms a typical terminal in perfect working tool, the perfect assistant, or the perfect image editor. Without doubt the most characteristic of the Galaxy Note 2.